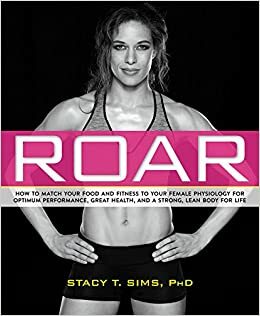 Roar by Stacy Sims is not your average fitness book. A book for women, Roar analyzes the differences between men and women in terms of fitness and how this affects your performance and life. Her mantra: Women are not small men so quit eating and training like one. The book discusses how hormones are the driving factor in these differences and how women need to adjust their training to take that into account. In essence, for decades all fitness advice was based on men’s bodies. Women are fundamentally different and if a woman wants the results she desires, she had to treat herself as different. Sims begins with a discussion on the menstrual cycle and how women’s bodies are affected. At the beginning of the cycle (low-hormone phase) women’s bodies are most like men’s because estrogen is low. It is the time of our peak performance and strength gains. The end of a woman’s cycle (high-hormone phase) work will seem harder. This book is full of facts on how women’s bodies make muscle, how we keep this muscle, the importance of recovery time and rest time, nutrition and hydration. She covers pregnancy and all stages of a woman’s life. Her goal is to help you gain top performance, great health, and a strong lean body for life. Fascinating book that made sense to me especially as I’m getting on towards menopause. There are some days where I feel horrible, bloated, can barely drag myself to the gym, and downright blah! This book explains why. The importance of protein to women. I’ve just now figured out the kind of protein you want (leucine and casein and whey) and what they do. Also, the importance of BCAA’s (branched-chain amino acids) and the importance of recovery time. Her discussion of hydration was fascinating as she describes the actual process, how your body needs sodium and a sugar (not fructose) for optimum performance. The importance of carbs as a recovery drink. For a while now I’ve been cutting my recovery drinks because they were high in carbs. Sims says no. We need all that protein and carbs in order to build muscle and keep it after a hard workout. Caffeine helps your performance. This verified my coffee habit. How women’s bodies cool down differently than men and sweat differently as well. Lift heavy (something I already knew) to build muscle. Women are so scared of looking bulky they only lift minimal weight which is not doing them any good. This will make strong bones as well and help you keep more of your muscle that you will naturally lose as you age. These were just some of my favorite facts. I highly recommend this book for women. It will confirm things you already know (the Zone Diet is the way to go) and give you more information on hormones, aging, and the effect on your training. Excellent read!